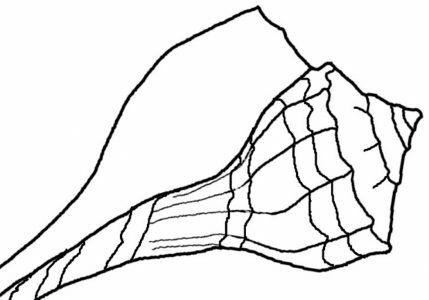 The Knobbed Whelk (Busycon carica), Channeled Whelk (Busycon canaliculatum), Pear Whelk (Busycon spiratum) and Lightning Whelk (Busycon contrarium) can all be quite large – the Pear is the smallest. Common characteristics include their long shape with a wide opening down the length of the shell. The Lightning Whelk is another one I find often in the backwater areas. It’s usually small like the pear whelk, but this one can grow to be 16 inches long. It is recognizable by it’s left-side opening. This is a fairly new photo of the knobbed whelk. I discovered it in January just offshore on an island in the Indian River backwater. A hermit crab was living inside, so I got some photos and returned it to the water. The channeled whelk is not a shell I have found in one piece. It grows to be 7.5 inches in length. The top spiral part of the shell differs from the other whelks because it looks extended, like someone pulled it out. The whorls on the other shells are tight and semi-flat. This is the only channeled whelk I have found and even though it was very broken it turned out there was a hermit crab living in it! I had to take it back and return it to the water. The Channeled whelk only lives along the northeastern coast of Florida to about halfway down the state. I guess that explains why I don’t see many of this kind of shell.